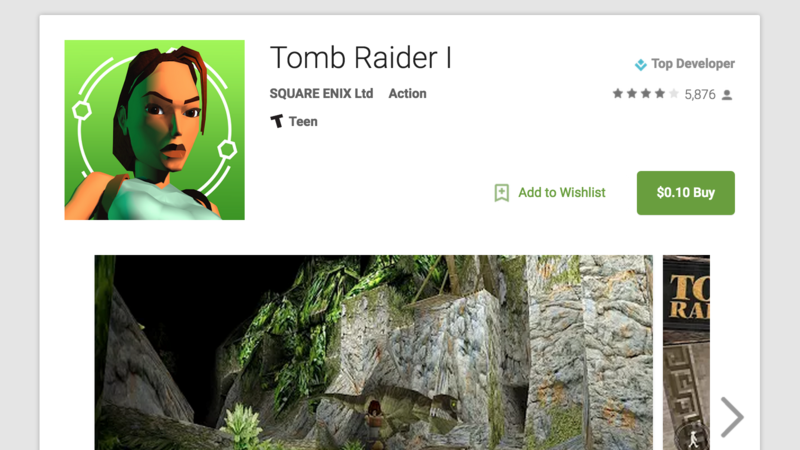 Back in April, Square Enix released the original Tomb Raider game on Android for just $0.99. The title that began Lara Croft's long-lasting career as a polygonal heroine came to Android with all the levels (and dinosaurs) players remember, along with the "unfinished business" levels. The controls aren't ideal but the game brought controller support and an undeniable nostalgic vibe. Today, the classic title has dropped to just $0.10 on the Play Store. Compared to the already low price of just under a dollar this might not seem like a huge drop, but honestly at a dime it's even harder not to grab Tomb Raider if you haven't already. Unfortunately though, it seems like this deal might only be happening in the US right now, as we've heard from users in Europe and India that aren't seeing the deal. If you're outside the US and see the discount, let us know. Update: According to commenters below, it looks like the deal is happening in Brazil, Mexico, Canada, and France as well.